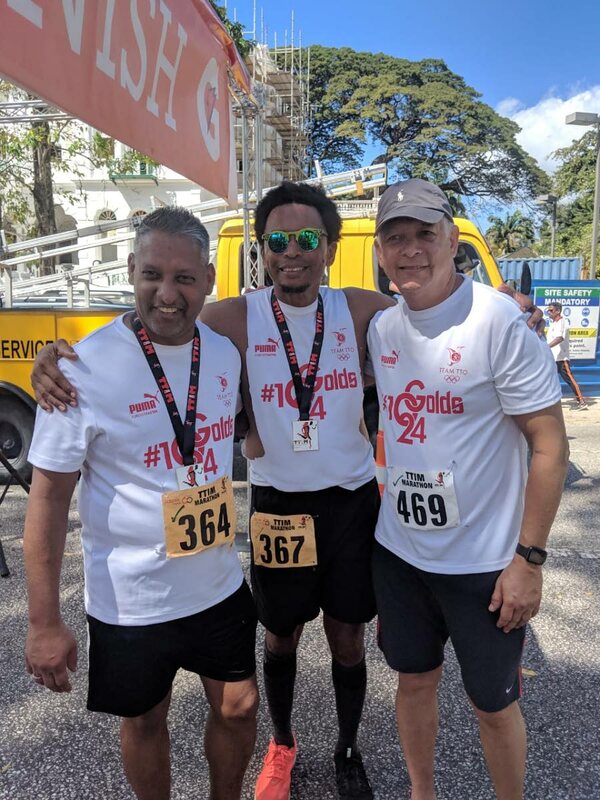 TTOC president Brian Lewis,centre, is flanked by Agriculture Minister Clarence Rambharat,left, and Mayor of Port of Spain Joel Martinez after they completed the TT International Marathon, on Sunday, at the Queen's Park Savannah. TT Olympic Committee (TTOC) president Brian Lewis has thanked all corporate bodies, the many recognisable personalities and regular citizens who supported the 42-member Team TTO and by extension the TTOC’s Athlete Welfare and Preparation Fund at the TT International Marathon (TTIM), on Sunday. Lewis, who took part in the marathon for a fifth time, said he is hoping all who pledged their financial support for the athletes’ fund will honour it. Also, in the Team TTO marathon walk group were Port of Spain Mayor Joel Martinez, Agriculture Minister Clarence Rambharat, members of the media, the protective services, corporate leaders and other notable personalities. Many in the group attempted the 26.2 mile challenge for the first time. “We will be following up on the corporate entities who would have pledged to the fund, as well as individuals. That is an important part of it,” Lewis said. The target of the fund is to generate $1 million and more in funding annually. It both complements athletes’ existing earnings and in some cases compensates for those who are unable to sufficiently finance their diet, training, competition costs and other expenses national elite athletes face en route to competitions such as the Olympics. The TTOC featured a team for the marathon walk for the purpose of raising funds directly toward the fund and to raise awareness of the fund, so as to attract more potential donors. “The TTOC is very cognizant of the fact that training to be an Olympic champion is a full-time commitment that demands discipline and dedication to maintain competitiveness and to win medals,” Lewis said. “The unfortunate reality,” he said, “is that many TT citizens react and recognise the achievements of national athletes only upon seeing them on an Olympic or World Championship podium with little regard as to the challenges endured en route to their achievement. Lewis said athletes who are well-financed have an edge and that TT cannot compete any longer on the basis of talent and potential. Given the dismal state of the economy, Lewis said the TTOC will continue to seek innovative ways to support the national athletes, in keeping with its mandate. The TTOC will host a number of other ventures throughout the year and into next year and Lewis has urged the public to be proactive in helping the athletes reach the world’s biggest stage. Reply to "Lewis: We can’t wait until 2020 to help"